You may have noticed that we always forget the zebra pot containing our chilli for the 1st night’s dinner in our holiday vlogs. It’s a running joke in our house, but we’ve only forgotten it twice. Maybe three times, um – actually four? Anyway, back to the plot. I do get asked a lot what is our recipe. So, here is our Zebra Chilli. No, it doesn’t contain zebra, it’s in relation to the pot we use. Serves 6 – Prep time 10minutes, cook time 1 ½ hours. To begin with Slice the onions into strips and add a splash of oil to a large pan. Fry the onions on a medium heat until they are just soft and starting to turn brown. Add the garlic and continue to cook for a couple of minutes, after which add the minced beef and continue to cook until the meat is brown. Now it’s time to add the wet ingredients. Start by adding the tomatoes, the kidney beans and finally baked beans. If you choose to leave out the beans add some tomatoes puree instead, this will thicken the chilli and add a nice tomato flavour. With all the wet ingredients added continue to cook and bring the pan back to a gentle simmer before adding the spices. Start by adding the stock cube, then the chilli powder. If you like it spicier add more chilli or crushed chilli flakes, if you don’t like it so hot try a medium chilli powder instead. Now add the smoked paprika. The smoked paprika adds a nice smoky flavour to the final dish, if you don’t have smoked paprika, you can substitute this with plain paprika, which makes for a lovely dish. Add a teaspoon of marmite to give a rich flavour to the dish and finally add a few twists of black pepper & some salt. Reduce the heat – leave to simmer on a low temperature for an hour. Stir occasionally and half an hour before its ready is time to start the rice. You can either do this on the cooker or in a microwave. For 3 of us we use 1 small mug of rice and twice the quantity of water. Place in a microwave proof bowl and stick the microwave on for 22 – 25 minutes. That’s it. 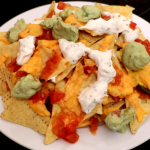 As a bonus, we also create our very own “cheating nachos”. 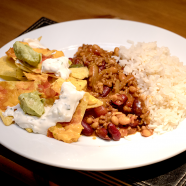 Although this does sound like a new series on NetFlix, it is a great dish to have up your sleeve in the caravan as it uses up ingredients left over from the burgers on the BBQ and snack items too. Start with a oven proof or microwave proof dish (we use a plate) and add a thin layer of chips. Spoon some of the salsa onto the chips in small quantities. Break up and distribute 3 or 4 slices of cheese over this layer and, if you are up for it add some jalapeno peppers too. Add another layer of chips and repeat the process until you have a tall pile of nachos. Top again with cheese, salsa and jalapenos. Place in the microwave for 5 minutes or in the oven for 10 minutes until the cheese is melted and the chips are warm. Remove and place small dollops of guacamole and sour cream over the top. Serve either as a side dish or as a great communal starter. And that’s it. It’s a simple meal, perfect for feeding the family and can be altered quite a bit to accommodate various taste buds. The baked beans calm the chilli powder and the smoked paprika make the dish taste of a smoky wood fire. If you want to see the meal being cooked, have a look at our YouTube clip below. Hi Dan and Family. I have always been impressed by your commitment to your zebra pot, so I bought one only to find instructions tell me “can t be used on a gas cooker” ? Any opinion on this folks?